They’d switched off the fountains in the square outside which was a shame, but I guess they didn’t want people to walk underneath Conrad Shawcross’s massive rusting iron sculpture disingenuously called ‘The Dappled Light of The Sun’, in case it fell on them. Squashed tourists could have made an interesting photo. It was big and ugly. The staircase was covered in brightly coloured lines of plastic tape, an installation by Jim Lambie. It was different, like wrapping buildings, but it felt a bit like graffiti in a sacred place. Throughout the exhibition there were pieces of text pointing out how ‘subversive’ an artwork was or even how subversive its position was within the building. Such sentiments were as embarrassing as watching Meryl Streep acting coy in Mamma Mia . Perhaps I’m getting on, but subversion in art went establishment over fifty years ago. Can’t we move on to sheer creativity or something - I wouldn’t dare be prescriptive here. Anyhow, the exhibition was interesting with lots of curious pieces both in paintings and sculptures. 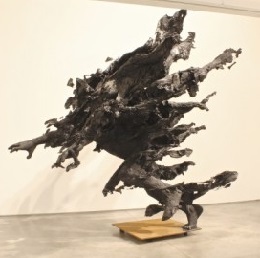 Tim Shaw’s massive statue ‘Man On Fire Version II’ was by far the most impressive. I thought it was an abstract piece until I walked past it and noticed a huge hand reaching out. “It must be a giant”, I thought and went around it looking for other body parts. I found another hand, two feet and eventually a head with open mouth, but I had to get practically under the sculpture to see this. It was all in black and apparently made from painted foam, polystyrene and steel but looked like clay and chicken wire. The flaming clothes flew back up into the air as the giant tripped and lunged downwards. Brilliant. It would fill half my garden if I took it home, but luckily there wasn’t any price in the catalogue. No temptation then. There were big differences in prices of the paintings. Pieces of about the same size and quality hanging next to each other had prices ten times different because one artist had RA after her name and the other didn’t. Which means, possibly, that visitors can pick up a bargain at the RA exhibition. I heard the following exchange between a couple looking at a painting, which confirmed the power of the RA brand.